I always shoot early in the mornings at the nearby parks, but yesterday I went out in the middle of the afternoon. Part of the reason I always shoot in the mornings this time of year is because I can't take the heat. Yesterday was in the 70's and the humidity was low so it felt pretty good. I decided to hit the swampy areas and check out the floating leaves. One thing I miss when shooting very early in the morning is the frogs, usually they are still sleeping when I go out, but in the afternoon they are everywhere. Most are long gone before I get close but there are always a few that will let you get fairly close. This is where your Tamron 180mm lens comes in handy, as the extra working distance gives you some extra room between you and your subject, so not to scare off the frogs. 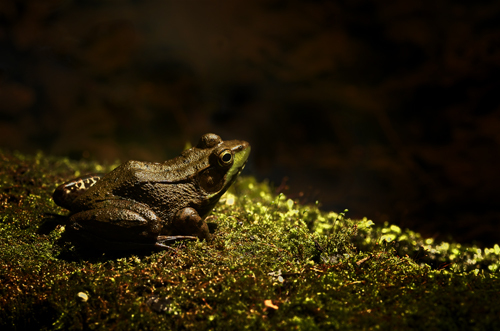 This one jumped up on a mossy stump which made a nice background, and was good enough to sit still while I set up my tripod and took my time shooting. This frog was really friendly as he sat still and watched me shoot his portrait, and then watched me work my tripod within a couple of feet from him while I was shooting moss on a stump. 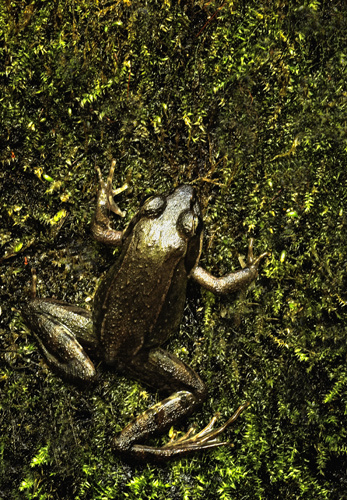 When I processed the image I darkened down the areas around the frog, and I call this image, Moonlight In The Swamp. Most frogs are not as friendly as these two, but if you run across enough frogs you'll usually find a couple that wanna be a star in your portfolio.